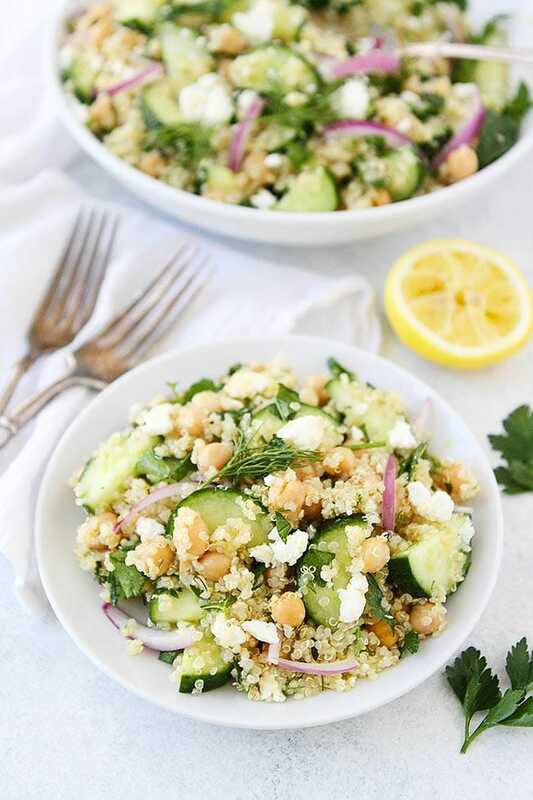 Cucumber Quinoa Salad with chickpeas, fresh herbs, feta cheese, and a simple lemon dressing is a great healthy side dish that goes great with any meal. I love quinoa salads. They are great for lunch, dinner, or for taking to a potluck. 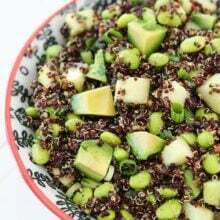 My current favorite quinoa salad is this simple Cucumber Quinoa Salad. I have been making it every single week and I can’t get enough. 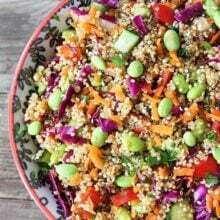 It is so fresh and delicious and the perfect quinoa salad for summertime or anytime! I love using the Smith’s Mobile App to create my grocery list. 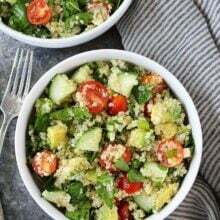 I add all of the ingredients I need for this salad (and other items) to my grocery list in the app and can pull it up when I get to the store. You can add items to your list at work, at home, on the go, then pull it up in store while you’re shopping. You can even build your cart and checkout in the app for easy curbside pickup. I love using the App to download coupons before I go shopping. Kroger offers its customers dozens of digital coupons worth hundreds of dollars in savings on the mobile app (over $400 worth). There are new coupons all of the time. I love that I can download them and the discounts are automatically taken off when I check out. And if Josh does the grocery shopping, he gets the discounts too because the coupons are tied to our customer number. We don’t have to mess with clipping coupons! It’s SO nice and there are always great deals. They offer special coupons for Free Download Friday, special weekend deals, special coupons for ClickList, and more! Using the coupons in the app has saved us a lot of money and it’s so easy! You can view the Weekly Ads in the App and quickly add sale items or specials to your shopping list. I like to shop what is on sale every week, so this is so helpful. You can also use the App to locate items in the store. Our Smith’s is big and sometimes I don’t know where to look for a certain item. I can pull up my App and it will tell me what aisle. It has saved me a lot of time. The App also has a barcode scanner that you can use to check prices and add items to your list or cart. You can refill your Kroger Pharmacy prescriptions directly from your phone or tablet. You can also shop pickup from the App, how nice is that? Yep, I am pretty obsessed with this App. It makes grocery shopping SO much easier…and cheaper too! There are so many wonderful benefits to using the App and it’s FREE! If you shop at a Kroger Family of Stores and haven’t tried it, you should download it today! 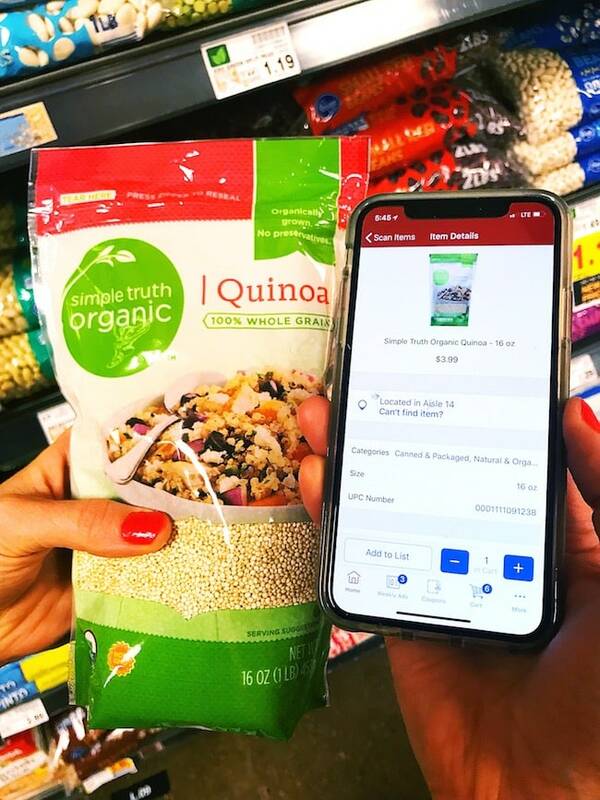 Special Offer: Download the App (or your Kroger store App) now through August 1, 2018 and you can save $5 off your next $50 purchase with an App-exclusive digital coupon. (The $5 off $50 will only be available to new app download users and the digital coupon will not be visible in the general coupon pool on Kroger Family of Stores. Limit one per digital account. Limited to new app downloads only. We reserve the right to withdraw this offer at any time. Offer redemption expires August 1, 2018. Only valid on a purchase of $50 or more. Offer is non-transferrable. $50 purchase is after all discounts are applied and excludes Alcohol, Tobacco Products, Fuel, Money Orders, Western Union, Green Dot Cards, Money Paks, Taxes, Postage Stamps, Gift Cards/Certificates, Lottery, Promotional Tickets, CRV, Prescriptions and Customer Care Center Services. Exclusions apply; see store for complete list. Void if reproduced, transferred or where taxed, prohibited or restricted by law. DO NOT DOUBLE. Must use Rewards card. Coupon only valid at Kroger Family of Stores). Ok, now back to the amazing quinoa salad. You guys need to make this one! The flavors are so fresh, making it perfect for summer. 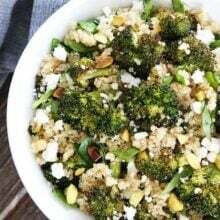 I love that quinoa is the base because it adds protein to the salad. I also add in chickpeas for an additional protein boost. 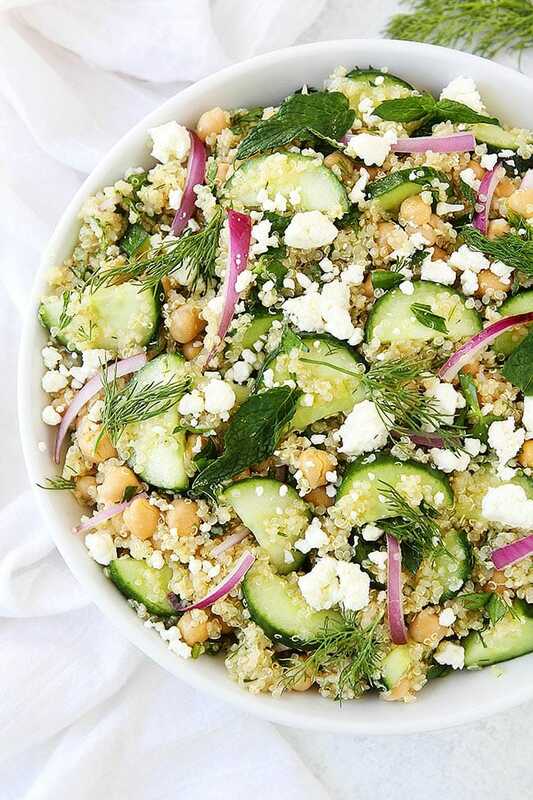 The crunchy cucumbers are cool and refreshing and go so well with the fresh dill, mint, and parsley. 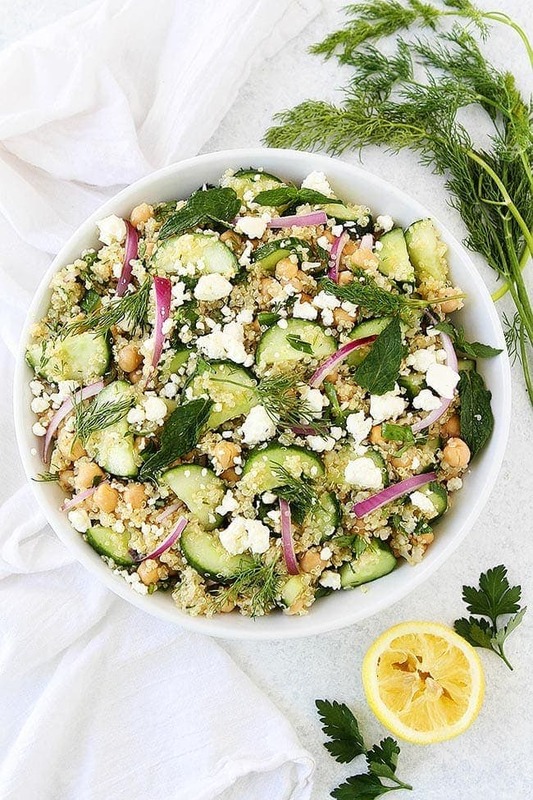 The creamy feta finishes off the salad nicely, but if you need the salad to be vegan or dairy-free, you can leave it out, the salad will still have plenty of flavor with the herbs and lemon dressing. 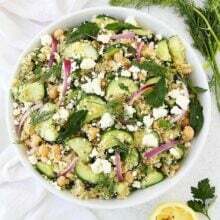 Make this Cucumber Quinoa Salad for lunch, dinner, or share it with your family and friends at a BBQ, picnic, or party this summer. I can’t stop making it! In fact, I am going to have it for lunch today, right after I go to Smith’s to get the ingredients. I just looked in my App and some of the ingredients have digital coupons! Score! 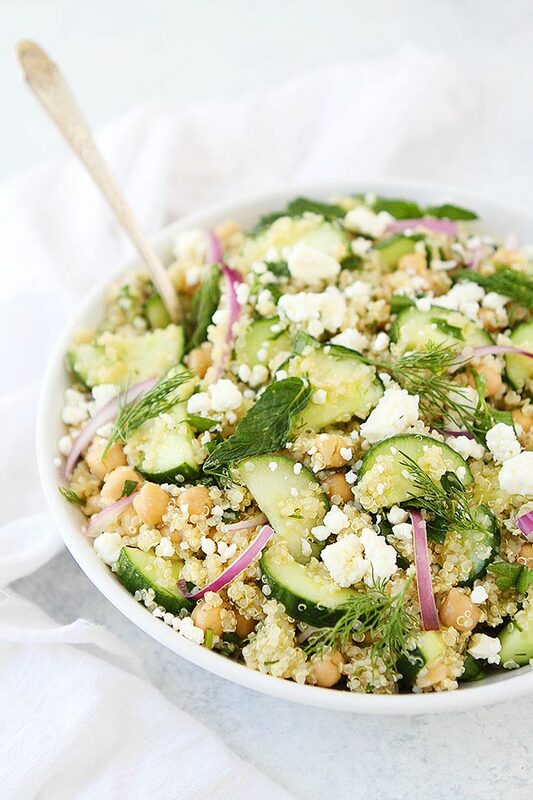 This fresh and simple Cucumber Quinoa Salad is a great side dish to any meal. To make the dressing, combine the olive oil, lemon juice, garlic, salt, and pepper in a small bowl or jar. Whisk until well combined. Place the cooked quinoa in a large bowl. Add the chickpeas, cucumber, red onion, parsley, mint, dill, and feta cheese. Drizzle in the lemon dressing and stir until combined. Season with salt and pepper, to taste. Serve. Note-follow the package instructions to cook the quinoa. Looks so good will have to try it. Looks super healthy and super tasty! I’ve been trying to eat more quinoa. Yes, pasta would be great or farro, orzo, etc! I’m highly sensitive and intolerant of quinoa…horrible I know. I used couscous and it was delightful! Yes, you can leave the cheese out for a vegan salad, it is still really good!